I guess it’s a slow week around here. Dad drove down today to pick up his riding mower (how dare he take away my his yard equipment! What, does he have leaves to rake or something?) and we had lunch together. He appreciated my buy-one-get-one meal deal with a deal card we got for free from one of David’s exes! No one appreciates my deals like Dad. Disapproving Rabbits is out. 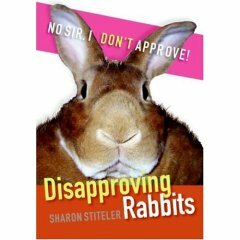 The premise is that she has pictures of lots of grumpy-looking rabbits and then captions the “disapproval.” I find the posts on her website quite funny, especially since I have my own disapproving rabbit, Arliss, as my personal example. I submitted her picture to the Disapproving Rabbits blog, though she has not yet been deemed cranky enough to appear! I ♥ ♥ ♥ the DR blog. So funny! There is simply no WAY that Arliss won’t make it onto the blog. Even her vet photo is crabby! I think you need to rename her Marge. I am just assuming there is a backlog of cranky rabbits and Arliss has to wait her turn (but she’s not very patient).